Compare prices from multiple car hire suppliers in Porto Airport to find the best available deal. A few of the car rental companies we compare include Gold Car, Budget, Avis, Hertz, Sixt and many more. 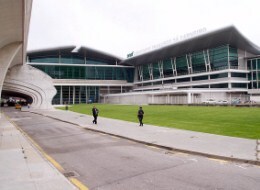 The Porto Airport, known formally as the Francisco de Sa Carneiro Airport (OPO) is an international airport that is located in close proximity to the city of Porto, only 9.6 kilometers from the center of the city. It is the third busiest airport throughout Portugal based on all aircraft operations and the third busiest airport in terms of passengers. In 2010, there were 55,432 aircraft movements and 5,279,362 passengers. Airlines that regularly service this airport through domestic, international, and charter flights include Air Berlin, EasyJet, Iberia, Lufthansa, Luxair, Ryanair, SATA International, Swiss International, and TAP Airlines. Most flights to the Porto Airport occur during the summer months of April through October when tourist season is at an all time high. Once visitors arrive to Porto Airport in Portugal, there are a number of amenities that they may be interested in, including some excellent shopping opportunities, car rental kiosks, and areas to receive tourist information about the area, including what there is to do, where to eat, and where to stay.